Who makes decent wheel adapters? Not looking for "drift with" quality just daily driving and wheel won't go rolling down the freeway. Whoever thought up this bolt pattern should be shot. Re: Who makes decent wheel adapters? i am in the market for a pair for the front so mine would need to be hub centric. been looking at the ichiba version 2. pretty sure they make it for 5x114 but don't know about the others. ^FB them, they respond pretty prompt. 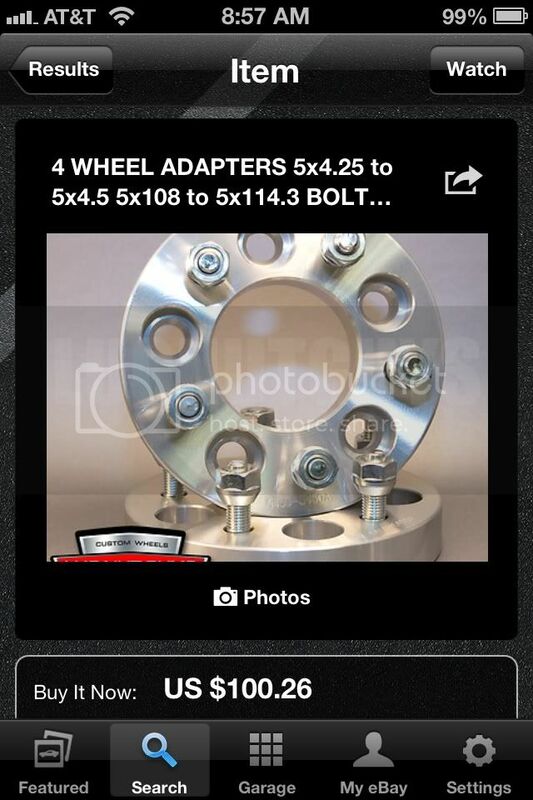 PBM (Part Shop Max) makes wheel adapter spacers??? Hmmmm. You can't really go wrong with Ichiba! They make adapters. Why not just go through FleaBay if you're just DD'ing it, I've seen them on there for $160 for a whole lot of 4. Also in that goofy bolt pattern because mostly Volvo enthusiast buy them. Emailed all 3 companies for a quote. Let's see who responds. Didn't find anything on ebay so hopefully these guys can help me out. So no local shops? I know hence why I said Volvo, some newer Chevys use the same pattern. @Phunk, if you're not tracking it FleaBay ones can't hurt, found these within 2 minutes. $100 for the whole lot, that's deals, top rated seller as well. Thanks for trying, unfortunately mine are 5x105. Only received 1 response so far. Sorry but we do not make a wheel adapter thingy. I had ichiba, project kics makes good ones as well. Just make sure they are hubcentric as well. "Sure, we can build exactly what you are looking for! They will be Hub and Wheel Centric to insure a perfect fit and no vibration problems. The cost would be $285 shipped to your door.... Just tell me what pattern you want and we can knock them out. Seems steep but I may be worth it if can't find anything cheaper. Ichiba is the one that said they don't make wheel adapter thingy. lol I'm sure he meant in size I want. Project Kics' website does not seem to work. I'll email a couple places that sell them.